Toughsorb™ Adhesive Mats are made of needle-punched polypropylene. Featuring self-stick adhesive backing, Toughsorb™ Adhesive Mats allow users to simply roll out mat, cut into size and adhere. 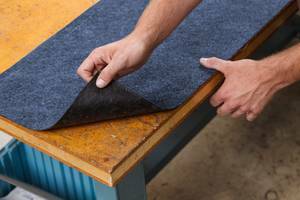 Designed with blue color finish, mats are easily adhered to and removed from surfaces for use with absorbing leaks, trips and spills indoors. Brady (NYSE:BRC), a global leader in industrial and safety printing systems and solutions, today announced its new Brady SPC TOUGHSORB™ Semi-Permanent Adhesive Mats. These mats are easily adhered to and removed from most surfaces for use absorbing leaks, trips and spills indoors or outdoors. The TOUGHSORB mats are constructed of needle-punched polypropylene, providing nearly 25% more absorbency compared to other options. The self-stick adhesive backing allows users to simply roll out the mat, cut it to size and adhere. They are also easy to remove, without leaving residue.